La Jolla Shores Hotel is one of San Diego’s beachfront places to stay. San Diego has two beachfront hotels and they are both located on La Jolla Shores Beach, a mile from “the village” of La Jolla and about 11 miles from downtown San Diego. One is La Jolla Shores Hotel and the other is the La Jolla Beach & Tennis Club. 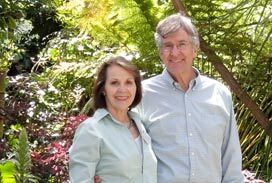 I recently toured La Jolla Shores Hotel and – even though I live nearby – I was really sorry when the visit was over. There’s something incredibly special about being right on the beach – kayakers and scuba divers come and go, flocks of pelicans fly overhead, and sometimes dolphins can be seen jumping in the waves just a short distance offshore. There a reason why La Jolla Shores is one of San Diego’s most popular beaches. In addition to the ambiance, I was really impressed with the hotel itself. Built in 1970, it has had its ups-and-downs, but I have to say it’s looking really good right now. The 128 rooms include “coastal view,” beachfront,” and “garden patio.” They are all nicely furnished and include flatscreen TVs, mini-fridges, in-room safes, bathrobes, coffee makers, wi-fi, and iHome docking stations. Some 24 rooms come with kitchenettes. The recreation facilities include a swimming pool (heated year round), a Jacuzzi, a tiny kiddie splash pool, and tennis courts. In addition, an excellent public playground is just steps away and the hotel provides beach chairs for sitting on mile-long La Jolla Shores Beach. Kayak rental shops, surf shops, and a half dozen good places to eat are nearby on Avenida de la Playa. Having said that, The Shores Restaurant in the hotel offers great food and an ocean view, and the adjacent bar is a popular spot for watching the sunset. The hotel also is the perfect spot for weddings right on the sand, a patio reception surrounded by colorful landscaping, and dinner for up to 150 guests in a private room. Rates start at $179 mid-week for a garden patio room, subject to availability. The way to get the best rate is to call the hotel. The website may not be up-to-date. Always ask about AARP and AAA discounts. The first two weeks of August are the busiest time, so book well ahead if that is when you will be in San Diego. If La Jolla Shores Hotel is not available, several places to stay in the village are very close to the water. 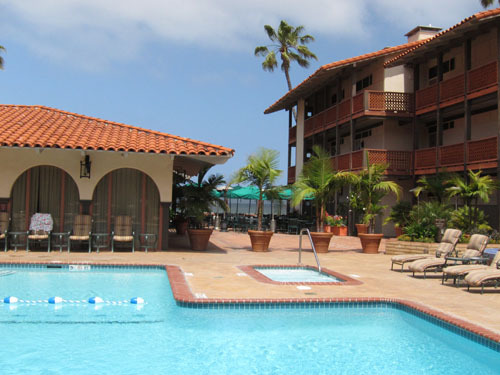 Check out La Jolla Lodging By Location to find one that might meet your needs. In my next post, I’ll tell you about the La Jolla Beach & Tennis Club, located a stone’s throw from La Jolla Shores Hotel – right on the same gorgeous beach.